RadioFeeds is available as a homebrew application for your Nintendo Wii. This application will enable you to listen to UK and Irish radio stations on your Wii via the internet! If you do not already have the Homebrew Channel, then please click through to http://hbc.hackmii.com/about/ for more information. We suggest using the Bannerbomb method, if your system menu version supports it. IMPORTANT: Please read our disclaimer below before doing attempting to install Homebrew Channel. You will also need to have Homebrew Browser installed on your Homebrew Channel. 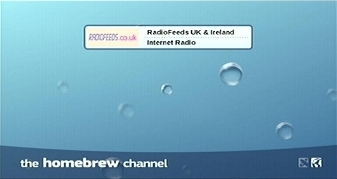 You will find two apps in the media section of Homebrew Browser: RadioFeeds UK & Ireland and RadioFeeds updater. Install both and run the updater application before running the main program. JANUARY 2018 UPDATE: Due to a change in server configuration, a patch to the updater app will be required. After downloading the updater app from the Homebrew Browser, please then download the patch file at http://www.radiofeeds.co.uk/wii/jan18update.zip. Extract the boot.dol file to replace the existing file on your SD card at: <SD CARD>:\apps\radiofeedsupdater\boot.dol. You should now be able to update the database correctly. As the video output from this application are mostly static images, it is recommended that to prevent screen burns on your television, you should connect your Wii's RCA (phono) outputs directly to a stereo or to your home cinema system, whereby you can continue to listen to your desired radio station without having to leave the screen switched on. If you experience any problems with the application or have any bugs to report, please feel free to contact us. - Attempting to listen to certain stations with a dead stream may cause your Wii to appear to hang. Either press the Up or Down cursor button to select another station (there will be no apparent change on the screen when you do this), then press A to play this stream. This will unfreeze the menu and navigation will be possible once more. - Should the buffer fail to fill, this may cause the application to stop responding to further station requests. Should this occur, please reset your system by holding down the power button on the front of your Wii, before pressing it again once more. - Station streams using RealAudio, QuickTime or Flash Players are not included in the directory. RadioFeeds for the Wii is based largely on the MPlayer CE homebrew application, also available for the Wii at http://wiibrew.org/wiki/MPlayer_CE.